A new survey finds overwhelming bipartisan support for provisions in a bill that would give judges greater discretion to ease prison sentencing, sponsored by U.S. Senator Charles Grassley (R-IA). Some provisions were also contained in the House-passed First Step Act. Both pieces of legislation would roll back mandatory minimum sentences for drug offenses that were set in the 1990s in response to a surge in crime, which has since abated. Such mandatory minimums played a key role in the more than doubling of the rates of incarceration that occurred in the subsequent decades. Proponents of the bill argue that this level of incarceration was an over-reaction that should be moderated, while opponents of the bill credit the high levels of incarceration with the reduction in crime. 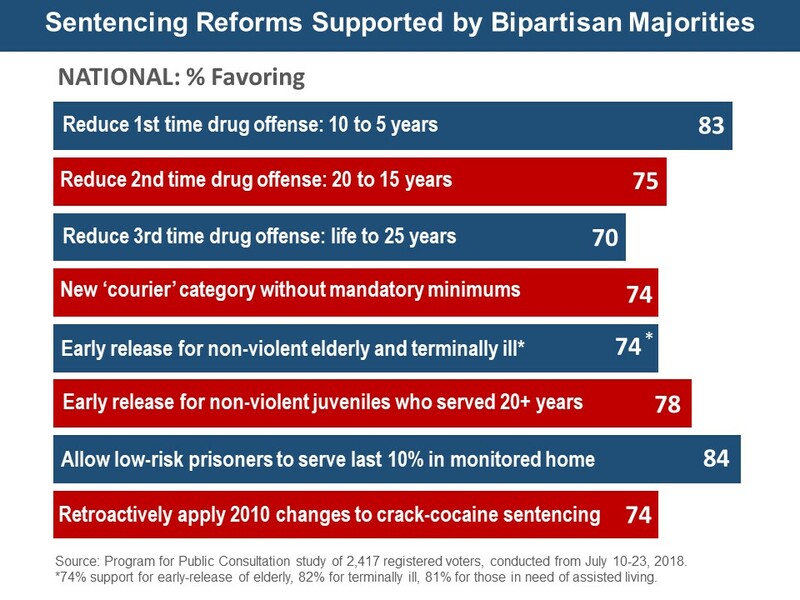 Respondents were presented a briefing that included the historical background of the issue and asked to evaluate a series of strongly-stated arguments for and against reducing mandatory minimums for serious drug offenses, and for the other reforms proposed in the bill, before making their final recommendations. In conclusion, 83% favored lowering the mandatory minimum of 10 years in prison to five years for one serious drug offense (Republicans 76%, Democrats 90%). Three quarters (75%) favored reducing the mandatory minimum of 20 years to 15 years for two such offenses (Republicans 66%, Democrats 84%). Seventy percent favored reducing the mandatory minimum of life imprisonment for three such offenses (known as ‘three strikes and you are out’) to 25 years in prison (Republicans 61%, Democrats 80%). The survey was conducted by the Program for Public Consultation (PPC) at the University of Maryland, and released today by the nonpartisan organization Voice of the People. The sample of 2,417 registered voters was provided by Nielsen Scarborough. Very large bipartisan majorities also favored other provisions in the bill that give judges the discretion to release inmates who have been determined to pose no risk to society and meet other requirements. Three quarters (74%) favor allowing judges to release inmates who are 60 years or older and have completed at least two thirds of their sentence (Republicans 67%, Democrats 83%). Eighty two percent support allowing early release for prisoners who are terminally ill (Republicans 79%, Democrats 87%) and 81% for prisoners who are so ill that they need to be in some type of assisted living facility (Republicans 77%, Democrats 86%). Similarly, large majorities (overall 78%, Republicans 68%, Democrats 87%) favor giving federal judges the option to determine whether prisoners – convicted as juveniles who have served at least 20 years in prison – still pose a threat to society, and, if not, to release them from prison and place them on 5 years of supervised release. Another provision with overwhelming bipartisan support (84%, Republicans 79%, Democrats 89%) gives the Bureau of Prisons the option to allow selected prisoners to serve the last 10% of their sentence in a monitored home setting, provided that they pose a low to moderate risk of repeating their criminal activity and participated in a recidivism reduction program. Prisoners who participate in programs —such as drug or alcohol treatment, or employment training—that reduce the risk of renewed criminal activity will have a higher chance of being selected for the program. Sixty four percent (Republicans 52%, Democrats 75%) go further and favor allowing this option for the final 20% of sentences for such inmates. Three quarters favor the bill’s provision making retroactive the sentencing adjustments for crack as compared to powder cocaine. Starting in 1986, sentencing guidelines counted an amount of crack cocaine as equivalent to 100 times that amount of powder cocaine. In 2010, this was changed, counting crack cocaine as the equivalent to 18 times the amount of powder cocaine. However, those sentenced prior to the new guidelines were not covered by the new law. Seventy-four percent overall (Republicans 64%, Democrats 84%) favor making retroactive this new sentencing guideline to sentences from before 2010. Currently, someone whose role is limited to transporting or storing illegal drugs or money related to drug deals is still subject to the mandatory minimum requirements. The bill proposes creating a new category for such cases, called ‘couriers,’ which would still be subject to punishment, but would not be subject to mandatory minimums. This idea was favored by 74%, including 64% of Republicans and 83% of Democrats. The survey was conducted online from July 10 to 23, 2018, with a national probability-based sample of 2,417 registered voters, provided by Nielsen Scarborough from Nielsen Scarborough’s sample of respondents, who were recruited by mail and telephone using a random sample of households. The margin of error is +/- 2.0%. Members of the public can go online and go through the same survey (called a “Policymaking Simulation”) to learn more and to weigh-in on the topic with their Members of Congress. http://vop.org/simulations/sentencing/.